Alice Smith in History on 28 November, 2016. 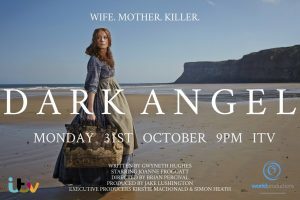 Dark Angel, ITV’s take on the grisly story of historical North East serial killer Mary Ann Cotton is a thought-provoking mini-series that guides the viewer through a particularly dark chapter of the region’s history. Firstly, in terms of narrative, exposition is on the light side – at times it’s hard to keep track of how many pregnancies had elapsed, or whether the child that has just died was the same we had seen born ten minutes ago. But this is understandable given that Dark Angel covers over a decade of action in just two episodes. Moreover the drama manages to remain gripping and avoids repetition, quite a feat given the near-identical circumstances of all Cotton’s victims. Some might argue that Dark Angel was lacking in cinematic artistry. Indeed, the words ‘dark’ and ‘angel’ were repeatedly shoehorned into both episodes, while the recurring allusions to a ‘nice cup of tea’, paired with lingering shots of the teapot (Cotton’s chosen method of dispensing poison) felt rather laboured. However the drama remained gripping and enjoyable throughout. It’s also refreshing to see a different side to history that has been avoided in other recent period dramas like Downton Abbey and Victoria, which focus on the lavish lifestyles of aristocracy and royalty. Dark Angel gives a unsanitised and unromanticised snapshot of the 19th century North East, and it’s interesting to see the region’s heritage reflected in the industrial communities of shipbuilding and mining which now no longer exist. Meanwhile, the dynamics between Cotton and her mother and stepfather in the first half of the first episode give a surprisingly touching insight into how normal families functioned in a world of hardship and deprivation. Acting wise, Alun Armstrong is, as ever, convincing and likeable; meanwhile, Joanne Froggatt is a fantastic choice as Cotton, with an impressive accent and enough complexity for the audience to remain captivated even as she commits murder after murder, just as the real life Cotton must have charismatically attracted her victims. While many background characters are slightly two-dimensional—disapproving maiden aunt Helen Robinson and Joseph Nattrass the smouldering Victorian bad boy spring to mind—the acting itself is of a good quality throughout. 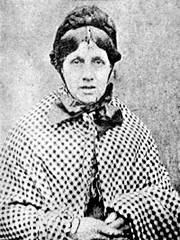 However, one key aspect of the adaptation’s approach to Mary Ann Cotton did not sit so well with me. This can be summed up by one of the titular character’s lines in the closing few minutes of the drama: ‘I just what every woman wants. More than coal dust and child birth and men who think saying “I love you” is enough. More than this world can give me.’ I felt this added an unnecessary slant on a story that’s not simply of a desperate woman killing men who arguably perpetuated Victorian women’s subjugation, but of an individual who killed her own children, mother and close friend. The miniseries even depicted Cotton as murdering the children of her third husband James Robinson as revenge for his rebuffal of her – not a misguided attempt at gaining the kind of opportunities denied to the working classes in 19th century England, but an act of spite. Let’s be clear: Cotton’s child killings didn’t represent some kind of frustrated forerunner to suffrage, and no matter how rightly concerned we are with women’s rights now, we shouldn’t try to qualify the horrific acts of Mary Ann Cotton by framing them in that context. Overall, however, Dark Angel was a solid period drama, one in which it was good to see a woman at the heart of the narrative. The great acting and bleak locations just added to the eerie, historical feel of the miniseries. Despite ITV’s questionable approach to Cotton’s motivations and the other imperfections I’ve outlined above, I would still recommend curling up to watch Dark Angel with a nice cup of tea as the nights draw in.